This Coconut Cream Pie takes a buttery crisp prebaked pastry crust and fills it with a coconut flavored cream. The crowning touch to this American favorite is lots of whipped cream and a sprinkling of toasted coconut. Very appealing, very comforting, and very tasty. When you make this pie, the filling isn't baked in the oven, so the pastry crust needs to be prebaked. On the site there is a recipe for a buttery crisp prebaked pie crust, along with a demonstration video. Once made, allow the crust to cool completely before filling with the coconut cream. The secret to a rich coconut flavored Coconut Cream Pie, is to use a combination of unsweetened coconut milk and whole milk in the filling. (Unsweetened coconut milk is not the same as sweetened coconut cream that is used to make pina coladas. Unsweetened coconut milk is a thick milk made from the grated meat of a coconut. It is usually sold in cans and you can find it in some grocery stores, specialty food stores, and Asian markets. Now, if you cannot find it, you can simply replace it with an equal amount of whole milk.) The coconut cream filling is like a vanilla pudding in that it is cooked on the stovetop. To ensure that your filling is wonderfully thick and smooth, stir constantly, making sure to stir the bottom and sides of the saucepan so you don't end up with small pieces of cooked egg. However, if you find this happening, simply strain the filling to remove any lumps. Once made, flavor the filling with vanilla extract and rum (optional), plus whisk in some butter to help make the filling silky smooth. I also like to stir in some toasted dried coconut, either sweetened or unsweetened, shredded or flaked. Toasting the coconut brings out its full flavor and adds a nice crunch. Once you pour the filling into the pastry crust, over with plastic wrap, and refrigerate for a few hours (or overnight) to thicken the filling so it doesn't run when you cut into it. 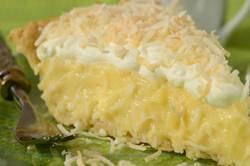 Just before serving, whip the cream, spread on the chilled filling and garnish with toasted coconut. Coconut: Preheat oven to 350 degrees F (180 degrees C). Place the dried coconut on a baking sheet and bake for about 5-10 minutes or until lightly browned. Watch carefully and stir the coconut a few times so it bakes evenly. Remove from oven and let cool before using. Meanwhile, in a heatproof bowl, whisk the egg yolks with the remaining 1/4 cup (60 ml) milk. In another small bowl whisk the sugar with the cornstarch (corn flour) and salt. Add the sugar mixture to the egg yolks and whisk until smooth. When the milk just starts to boil, remove from heat and, whisking constantly to prevent the eggs from cooking, slowly add the milk to the egg mixture. (If you do get a few pieces of cooked egg, pour through a strainer.) Then pour the mixture into a medium saucepan and cook over medium heat until boiling, whisking constantly. Continue to whisk for another 30 - 60 seconds or just until it becomes thick. (The filling starts out quite thin but will thicken as it cooks. When it comes to a boil it may be a little lumpy. Stir vigorously and the lumps with smooth out.) Remove from heat and immediately whisk in the butter, vanilla extract and rum (if using). Gently stir in 1 cup (240 ml) of the toasted coconut. Pour into the baked and cooled pastry crust, cover with plastic wrap, and refrigerate for 3-4 hours (or overnight) or until firm. Whipped Cream: Put your mixing bowl and whisk in the freezer for about 15 minutes. Then beat the whipping cream, powdered sugar, and vanilla extract just until stiff peaks form. Spread or pipe the whipped cream over the filling. Garnish with the remaining toasted coconut. Serves 8 - 10 people. Preparation time 1 hour.